We’ve all seen the recent video of David Dao, an innocent United Airlines passenger being knocked around, bloodied and brutally dragged off a plane semi-unconscious. What is surprising is that people are surprised. For some companies, these are patterns, not mistakes. United and Wells Fargo are very similar in their culture. We can learn from looking at both of them together. Last fall, Wells Fargo was exposed for creating 2 million fake accounts, and brazenly using their customer’s names to do it. Just a couple days ago they were also exposed for aggressively pushing small business owners into extremely confusing and costly credit card processing schemes. One expert said, “Wells Fargo makes it all but impossible for small businesses to understand which fees are being assessed and how.” Again, what’s surprising is that these things get reported like we should be surprised. It’s all part of a pattern. In 2009, Wells Fargo took away the business credit lines of thousands of small business owners, including me, essentially in the middle of the night, with no notice of any kind, and no consideration for the health of the business. I just woke up in the morning and the credit line of our extremely healthy business that had grown 409% in the last three years, was gone. I personally know of many, very healthy businesses that were staggering as a result, and some of them went under. Highly profitable, long-standing clients like us, received the same treatment as the few that were in trouble during the recession. These, and many other incidents over many years speak to patterns, not mistakes, and to something much deeper and insidious than incompetence. What we miss is that these are just very predictable symptoms of a single, much bigger issue that gets cursory attention, but is in fact, the direct and predictable cause of all these problems – company culture. You don’t create culture, you simply live out what you believe. These companies both have crisply stated values statements in their annual reports that are quite admirable. The problem is they don’t believe a word of it, and their actions prove that. Both United and Wells Fargo have company cultures built on two obvious beliefs. 1) Where there is confusion, there is profit. 2) Customers are wallets, not people. They are only as useful as the amount of money we can extract from them. To be clear, neither of these are STATED beliefs in their annual reports. But that is exactly the point. Those manicured values statements are not what they believe. What they DO is what they believe. I’ve been a wallet for United Airlines for years. I only fly them when I have to, but the experience is consistent. I can never figure out what my actual cost will be for all the add on fees until the flight is over. And customer service is mechanical, and directly related to the hierarchy of money extracted from the wallet – most of us are additional cargo used to fill up the plane. For ten years I’ve been treated like David Dao. The only difference is I never bled physically, just emotionally, mentally, and financially. I find nearly universal agreement among fellow travellers when I ask them how they feel. So it was no surprise when they finally physically bloodied a passenger. The CEO, Oscar Muñoz, who should have resigned long before David Dao was beat up, demonstrated United’s true culture in his initial responses, saying United was only trying to “reaccommodate” passengers from an overbooked flight (which was not overbooked), and that David Dao had been “disruptive and belligerent”. After those tone-deaf statements were received with outrage, he attempted to backtrack, but justifiably United’s stock has been “reaccommodated”, falling by over $200 million through yesterday. Again, no one should be surprised. It’s a pattern. In 2008, United broke Dave Carroll’s guitar and refused to compensate him. So he wrote the song, “United Breaks Guitars“, which went viral and has over 17 million views to date. Back then, United’s stock plunged over 7% from that incident. Thousands of passengers like me have been having similar, but less traumatic experiences for years since David’s incident. So it’s no surprise United moved from smashing a guitar to smashing a face – it’s a natural progression for a company that is not addressing root cultural issues that come directly from the top. 1) Focus on shareholder value instead of culture – GPWI found that companies which focus first on valuation consistently suffer with poor culture, lower customer satisfaction, higher staff turnover, and ironically, lower profit. Both Wells Fargo and United Airlines have demonstrated for decades now that profit is more important than people, both internally and externally. 2) “It’s not our focus” – the classic definition of culture is “a set of values that are a) strongly held and b) widely shared.” Please note, the definition is not “a set of values written in an annual report.” Clearly the value of putting the customer first is not strongly held or widely shared in either company, regardless of what they say in their press releases. 3) Violations of it aren’t immediately a problem – this is the most insidious of the reasons. In every case, these catastrophic debacles have started as tiny, local violations of stated, but not strongly held or widely shared values. And it didn’t seem to matter – somebody got away with it. And then somebody else got away with it. And then local managers, who experienced no downside from above, looked the other way, then regional managers, and finally, in Wells Fargo’s case, the CEO looked the other way for almost two years. United Airlines has also been looking the other way and ignoring customer care for almost two decades. That falls on the CEO and the Board. They are directly responsible. GPWI’s report also revealed that companies that go public have a much harder time keeping their culture aligned with the empty values they bloviate about in their annual reports. That just points back to reason number one above, short-term shareholder value trumps long-term care of the culture and the customer. These aren’t isolated incidences, and no one should be surprised. They are patterns that stem from real, practiced beliefs, not the fancy sayings hanging on their walls with pictures of eagles. The culture isn’t changing in these companies. Having been caught again demonstrating their demonstrated values, they’re just employing temporary distraction strategies, like firing a few people who were doing exactly what the culture emphasized – treating customers like wallets to be picked. Where there is confusion, there is profit, and people inside these companies have learned through strongly held and widely shared long-term practices that people are wallets. Those are the cultural values of these companies. No matter how effusive the companies are in the midst of being caught once again, the old saw is still true – their actions speak louder than their words. 1) Do you have written values that align with how you do business? 2) Do you beat the drum of those core values gently and relentlessly as your most important leadership responsibility? If not, don’t be surprised when somebody does something stupid that you have to pretend to be appalled and surprised by. If your values aren’t strongly held and widely shared, it’s only a matter of time. Fancy statements are not culture. 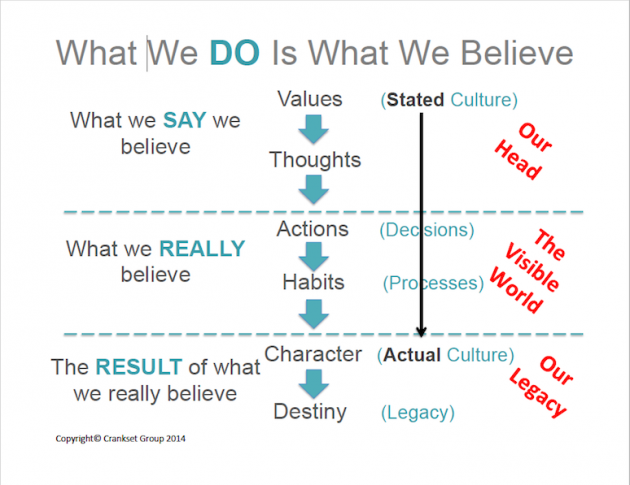 You don’t create a culture, you simply live out what you believe, one decision at a time. Stay tuned – another Dave Carroll or David Dao is just around the corner for both these companies. And nobody should be surprised then, either.